Stick blenders are a fantastic alternative to the more traditional jug blender. They create less washing up and mess as the only parts that needs to be cleaned are the blending blade attachment and accessories. They’re also far more convenient than jug blenders. All you need is a large enough container for the attachment and you can go to town. You can create a lot of different recipes with a stick blender including homemade sauces, soups, smoothies, and salad dressings – which are much healthier than anything you could buy pre-made in the grocery store. In this guide we’ll go over the most important features to look out for when choosing your own stick blender. So you can make the perfect choice. We’ve chosen some amazing products in our top picks, but the one we recommend the most is the OXA Powerful 4-in-1 stick blender. As it’s got the most powerful motor, multiple accessors, sleek modern design and more. It will cater to all your blending,whisking and mixing needs. You can visit Amazon.com here to find even more information on this top product. 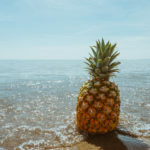 In this section we’ll be listing and going through some of the most important features and aspects to look out for when purchasing a stick blender for your own use. Stick blenders are incredibly convenient and usually really simple to use they are a great product to have in any kitchen and make recipes take less time to make. Another thing to look out for is the warranty. Sometimes the motor can get burnt out faster than usual, look for a warranty to protect yourself from any mechanical failures. Cord length is important when you are working with a handheld product, since it might get in the way while in use. Making sure the cord has a long length and isn’t flimsy are key points to look out for. Most stick blenders come with blades and accessors that are easily removed and most of them can be placed into a dishwasher. But all models vary. Make sure to read the information carefully to extend the lifetime of your product. We’ve all used a shoddy stick blender and had liquid shoot out everywhere before. The cleanup certainly isn’t worth the added convenience! Make sure the model has a weight to it. 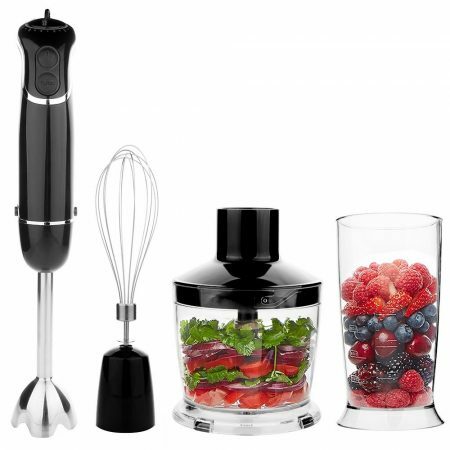 The BELLA hand immersion blender is perfect for all your blending and whisking needs. Both the whisk and blending blade attachments are versatile enough that they can be used instead of larger mixers and blenders saving you money. 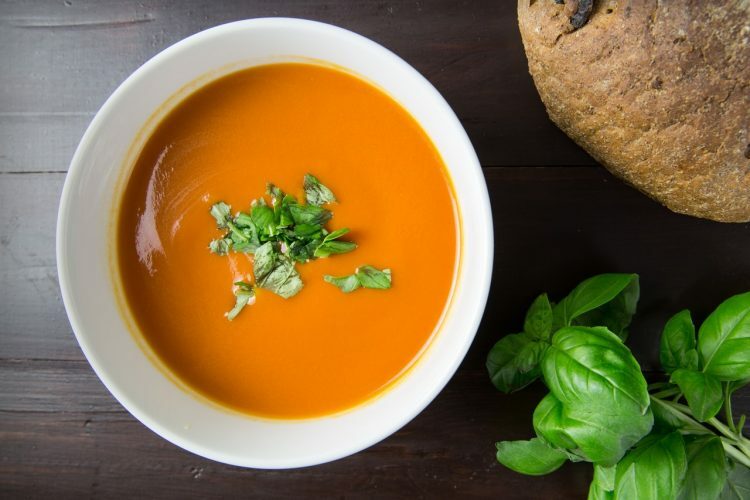 It’s got a 250 watt motor with a simple one-touch operation which makes it really simple to use and is perfect for making soups, smoothies, chutney, batters for baking and more. The attachments are dishwasher safe making clean up fast and safe, this stick blender also includes a 2 year warranty giving you peace of mind. 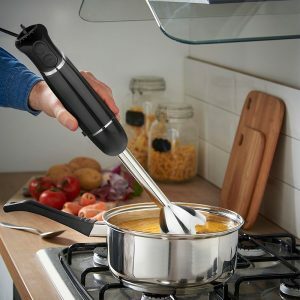 We think the BELLA immersion hand blender is the best overall blender with it’s affordable price, sleek design, multiple attachments making it a great choice. With both the whisk and blending blade attachment you can make an endless amount of recipes giving you more variety at mealtime. Just make sure you have ample space before using the blender as the cord is quite flimsy and can get in the way. This Cuisinart smart stick hand blender is Amazon’s best seller and comes in a variety of colours to suit everyone’s kitchen. Including a 200 watt motor with 2 speeds and the stick design allows it to reach into all sorts of pots, bowls and mixing containers. It comes with a beaker which is great for blending smaller amounts like a salad dressing or chutney recipe. The beaker is dishwasher-safe and microwave-safe, it’s design was made for drip-free pouring and easy gripping while blending. We highly recommend the Cuisinart stick blender for anyone who is looking for a modern, stylish product that will mix and stir any food combination you choose with great results. The motor isn’t the most powerful so may just take slightly longer to get the results you want. If you’re looking for the best quality and most powerful stick blender then this OXA Powerful 4-in-1 stick blender is an fantastic choice. It comes with a high power 300 watt motor which will chop all kinds of foods whether wet, dry or frozen. It includes a whisk attachment, 600ml beaker and a 500ml mini processor bowl. 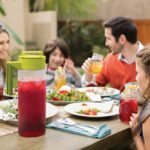 The detachable parts are dishwasher safe and BPA free which makes clean up simple and easy. With a sleek black design it will be a great addition to any kitchen, the blending stick is lightweight yet sturdy which has a rubberised grip for comfort. With it’s multiple speed settings + turbo mode you can quickly chop, mix and blend any combination of food you want using the OXA Powerful 4-in-1 stick blender. We recommend this particular product to anyone who has a larger budget as you will certainly get your money’s worth with this one over the years. The Hamilton Beach stick blender is affordable without some of the extra features, but makes a good first choice. 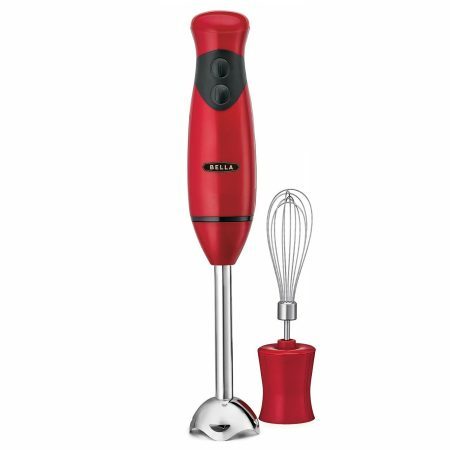 It’s got a 225 watt motor which is decent for the price, it includes a whisking and blending attachment to make more of a variety of recipes. The extra long cord length is a nice bonus, which will ensure you have enough room to work with while blending or whisking. 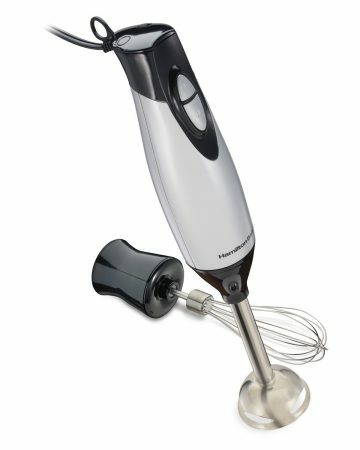 Overall the Hamilton Beach stick blender is up to the task of any blending and mixing, however the build quality isn’t the greatest and it doesn’t include a warranty. This product would be a great option for people who need an affordable stick blender for occasional use to get the most out of purchasing this model. If you intend to use one almost everyday a higher quality product would be more suitable. 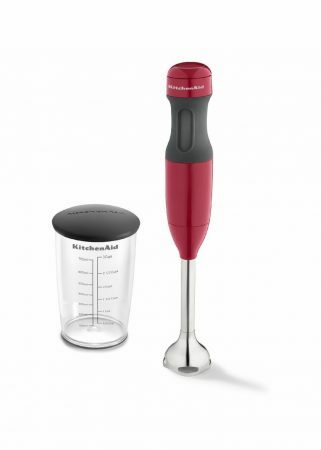 This KitchenAid stick blender is a great mid-range choice. It’s got a stainless steel fixed blade which will blend ingredients for soups, smoothies, milk shakes and more fast. It comes with a BPA free blending jar with lid which is convenient for small batches of food or a quick snack. The jar is dishwasher safe on the top-rack only. This blender comes with 2 speed settings to suit a wide range of different foods and has a comfortable grip handle for full control. Having a reliable stick blender to take the hard work out of mixing manually is a great product to have and the KitchenAid blender does just that. We recommend this product to anyone looking for a long lasting blender which also has a 1 year warranty for your peace of mind. After reading through this guide we hope you’ve been able to find a suitable stick blender for your kitchen. We chose the 5 best products we could in order to find the perfect one. Owning a stick blender makes it fast and easy to create healthy foods,drinks and snacks in your own home. 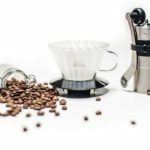 If you didn’t find one that suited you and you’d like to view different options, visit Amazon.com here to view all the best selling stick blenders they have. If you would like to learn more ways to use your stick blender you can head over to thekitchn.com for some smart ways to use it.